Your reason is now mature enough to examine this object. In the first place divest yourself of all bias in favor of novelty & singularity of opinion. Indulge them in any other subject rather than that of religion. It is too important, & the consequences of error may be too serious. On the other hand shake off all the fears & servile prejudices, under which weak minds are servilely crouched. Fix reason firmly in her seat, and call to her tribunal every fact, every opinion. Question with boldness even the existence of a God; because, if there be one, he must more approve of the homage of reason, than that of blindfolded fear. You will naturally examine first the religion of your own country. Read the Bible, then, as you would read Livy or Tacitus. The facts which are within the ordinary course of nature you will believe on the authority of the writer, as you do those of the same kind in Livy & Tacitus. The testimony of the writer weighs in their favor in one scale, and their not being against the laws of nature does not weigh against them. But those facts in the Bible which contradict the laws of nature, must be examined with more care, and under a variety of faces. Here you must recur to the pretensions of the writer to inspiration from God. Examine upon what evidence his pretensions are founded, and whether that evidence is so strong as that its falsehood would be more improbable than a change in the laws of nature in the case he relates. For example in the book of Joshua we are told, the sun stood still several hours. Were we to read that fact in Livy or Tacitus we should class it with their showers of blood, speaking of statues, beasts, &c.
But it is said that the writer of that book was inspired. Examine therefore candidly what evidence there is of his having been inspired. The pretension is entitled to your inquiry, because millions believe it. On the other hand you are astronomer enough to know how contrary it is to the law of nature that a body revolving on its axis as the earth does, should have stopped, should not by that sudden stoppage have prostrated animals, trees, buildings, and should after a certain time gave resumed its revolution, & that without a second general prostration. Is this arrest of the earth’s motion, or the evidence which affirms it, most within the law of probabilities? These questions are examined in the books I have mentioned under the head of religion, & several others. They will assist you in your inquiries, but keep your reason firmly on the watch in reading them all. Do not be frightened from this inquiry by any fear of its consequences. If it ends in a belief that there is no god you will find incitements to virtue in the comfort & pleasantness you feel in its exercise, and the love of others which it will procure you. If you find reason to believe there is a god, a consciousness that you are acting under his eye, & that he approves you, will be a vast additional incitement; if that there be a future state, the hope of a happy existence in that increases the appetite to deserve it; if that Jesus was also a god, you will be comforted by a belief of his aid and love. In fine, I repeat you must lay aside all prejudice on both sides, & neither believe nor reject anything because any other persons, or description of persons have rejected or believed it. Your own reason is the only oracle given you by heaven, and you are answerable not for the rightness but uprightness of the decision. I forgot to observe when speaking of the new testament that you should read all the histories of Christ, as well of those whom a council of ecclesiastics have decided for us to be Pseudo-evangelists, as those they named Evangelists. Because these Pseudo-evangelists pretended to inspiration as much as the others, and you are to judge their pretensions by your own reason, & not by the reason of those ecclesiastics. Most of these are lost. There are some however still extant, collected by Fabricius which I will endeavor to get & send you. 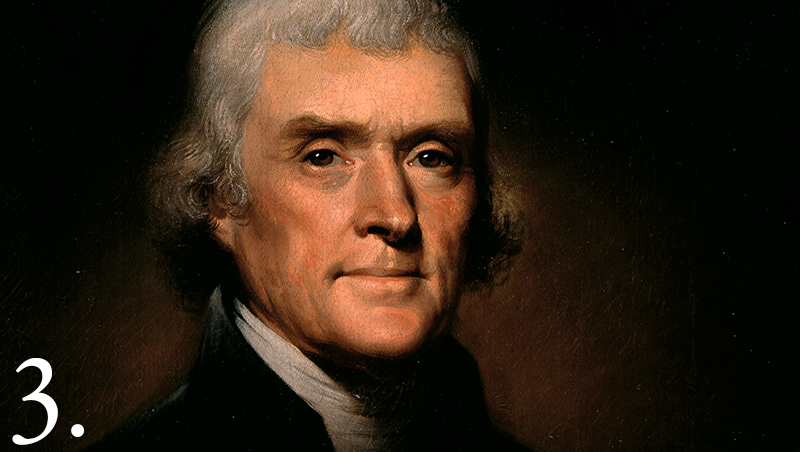 Jefferson, T. (1787, August 10). Letter to Peter Carr. Retrieved from teachingamericanhistory.org September 9, 2015.